Wedding invitation suites can be formal, informal, simple, elaborate, sophisticated or quirky. As a bride you have many pre-wedding decisions to make, and this is a big one. The couple. The date & time. The location. An RSVP option. Typically, invitations include many more details beyond the must haves. So how do you know; What to say? and How to say it? 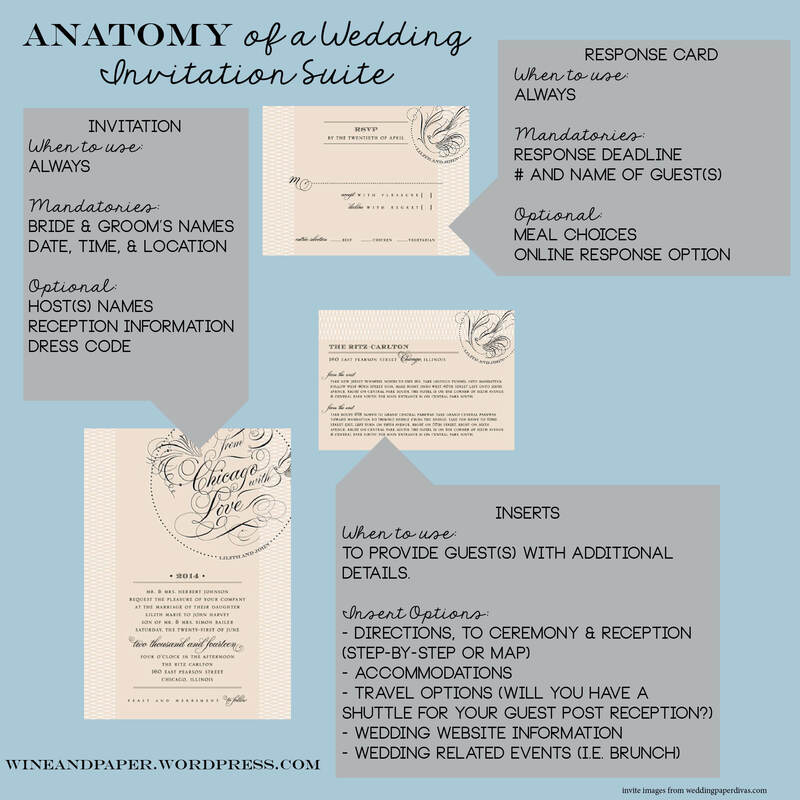 Take note of The Anatomy of a Wedding Invitation Suite! Once you have the answers to these key questions you can search for a wedding invitation suite that fits your theme and style. Holy, yikes! This is the challenging part of every invitation, but you want to do it right. Traditional invitations start by naming those issuing the invitations or paying for the wedding. Traditionally this is the bride’s parents, but today it can be a partnership between both sets of parents, just the groom’s family, or even completely financed by the couple! Evolving family structures and varying financial dynamics make this part of the process complex. Various format options are below in the How to write it section. Be sure to select the best one for your own situation. Request lines indicate your venue, however, this is not a rule you are required to live by. Traditionally this information (i.e. location, time, etc.) is found on a separate insert inside the wedding suite, not on the actual wedding invitation. I still recommend a reception insert for a formal and/or traditional wedding. However, if your big day is a more casual affair, including the reception information directly on the invitation is okay. If you want a third option, include on your invitation reception to follow – then on the reception insert list the details. Formality of your event is sometimes hard to figure out by your invitation suite and most people need you to state the obvious – if you don’t want to state “black tie” on your actual invitation, maybe put it on another inserted piece or mention it on your wedding website. You definitely want to include a response card. Response cards should state a deadline for RSVPs and a place for the number/names of guests attending. Some response cards give the option of a meal selection. Going green or nontraditional? Have an insert give the details of where to respond online! List the names on separate lines without an “and” between them. In this situation, the mother always comes first. If mom is remarried, use her married name. Traditionally, step-parents are omitted; however, this is your big day and you can add them if you decide to. Traditionally, deceased parents are not included on the invitation. I heavily disagree with this. If you chose to put a deceased parent on your invitation the wording should make it clear that the parent is not issuing the invitation. Titles are also omitted. The pleasure of your company is requested at the marriage of Katherine Joyce Tucker daughter of Jonathan Ralph Tucker and the late Elizabeth Tucker to William Dane Hupley. Formal: I recommend the usage of both. Informal: You don’t have to use middle names or courtesy titles. A more casual affair can use one or the other, or neither. Work titles always outweigh social titles. If a name on the invitation is listed with Doctor, that name goes first. On both your invitation and response card. Formal: The date and time should be spelled out on your wedding invitations, but never capitalized. “O’clock” is only used when your ceremony time begins on the hour. Informal: The date and time can be used in numerical form. Time not on the hour should be hyphenated. Time should always be followed by in the morning, in the afternoon or in the evening. The year should always be spelled out on your wedding invitation. The correct spelling of the year is two thousand twelve. There is no “and” between thousand and twelve, and there is no hyphen between two and thousand. Whatever method you choose, stay consistent. Showcase your theme and style through your invitations. Be sure to research your options before purchasing & if you are struggling, take a moment away, and remember a glass of red & a to-do list should get you through.